Has Donald Trump found a winning issue for the 2012 election cycle? As the multimillionaire real estate mogul mulls a presidential bid, he has turned up the volume on his calls for President Obama to release his own birth certificate. Trump has become so dead set on this issue that on Monday he released a copy of his own birth certificate to Newsmax, conservative website. 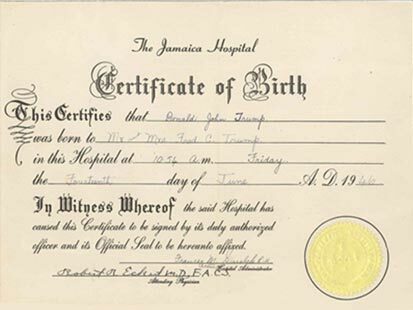 It shows that Donald John Trump was born at Jamaica Hospital in New York June 14, 1946, at 10:54 a.m.
Click Here to see a photo of Donald Trump's hospital certificate of birth. "This guy either has a birth certificate or he doesn't," Trump said in an interview on Fox News Monday. "I didn't think this was such a big deal, but I will tell you, it's turning out to be a very big deal because people now are calling me from all over saying please don't give up on this issue." Trump didn't stop there. In the interview he also called for an investigation into Hawaii Gov. Neil Abercrombie, who is close to the Obama family and led an unsuccessful effort to make public a copy of the president's birth certificate. "I think this guy should be investigated," Trump said. "He remembers when Obama was born? Give me a break -- he's just trying to do something for his party." Abercrombie's efforts were stymied by a Hawaii privacy law that forbids the release of such records without Obama's consent. The Obama campaign released a "certification of live birth," which is a shorter document that carries the same legal weight as the long one, in 2008. Trump has brought up the issue again and again. In a recent interview with ABC's "The View," he said that Obama has "a terrible pale that's hanging over with him" because of his refusal to release the document. In 2008, the Obama campaign circulated a "certificate of live birth" showing that the president was born in Hawaii in 1961, but the "birthers" are not convinced. Many continue to believe that Obama, who had an American mother and Kenyan father, was born outside the United States. 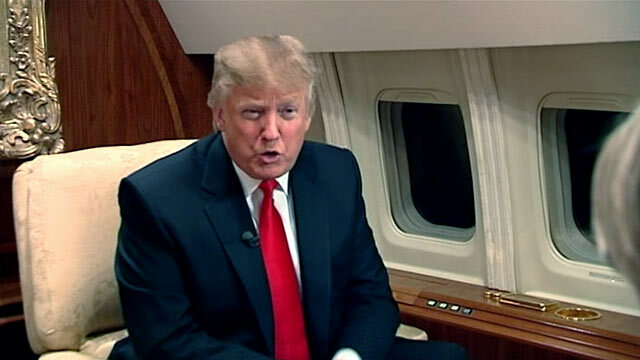 In an interview earlier this month with ABC News' Ashleigh Banfield, Trump suggested that birthers have been unfairly criticized for their skepticism. "I'm like a really smart guy. Everybody that even gives any hint of being a birther … even a little bit of a hint, like, 'Gee, you know, maybe, just maybe this much of a chance,' they label them as an idiot," Trump said. "I have a little doubt -- the reason I have a little doubt, just a little, just a little, is because he grew up and nobody knew him. You know?" But statements like these don't make Trump a birther, according to an executive at the Trump organization, who started a Draft Trump for President website. In an interviewMonday with ABC News, Michael Cohen said what concerns Trump is transparency. "He made a statement only because it's an issue that has been around now for over four years, and one would think that the president of this great country would pull out his long-form birth certificate, put the entire issue to rest," Cohen said. "But this pres who ran on a platform of transparency has decided not to do that." Cohen, who has been handling some political matters for Trump, including reaching out to Republican leaders and activists in such early nominating states as Iowa, also took issue with comments made by "View" host Whoopi Goldberg, who suggested that Trump's insistence that Obama release his birth certificate may be racially motivated. "Donald Trump is not a racist, he's not a bigot, he doesn't care if you're black, white, green, blue, indigo or violet," Cohen said. "He doesn't care. He treats everyone the same. Shame on her for playing the race card." Cohen also predicted that Trump would continue to bring up the birth certificate issue as he makes up his mind about running for president. "Mr. Trump always holds people accountable -- that's what he does," Cohen told ABC News, "whether it's a real life business transaction or on 'The Apprentice'"